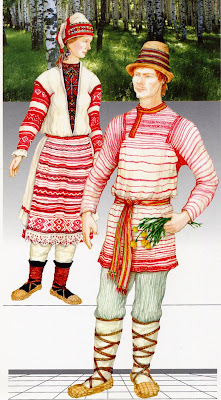 Hello All, As i mentioned in my last post about North Udmurt costumes, i am dedicating this posting to the kabachi. 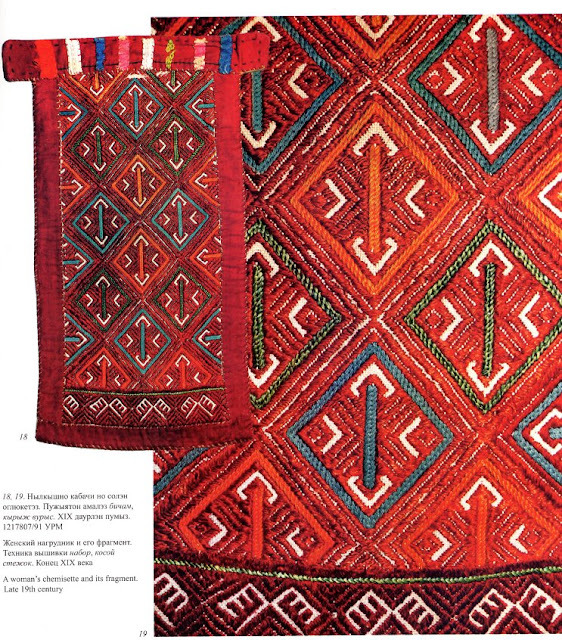 The kabachi is the single most distinctive piece of Udmurt costume [apart from the Aishon]. I will return to the Aishon at a later date. 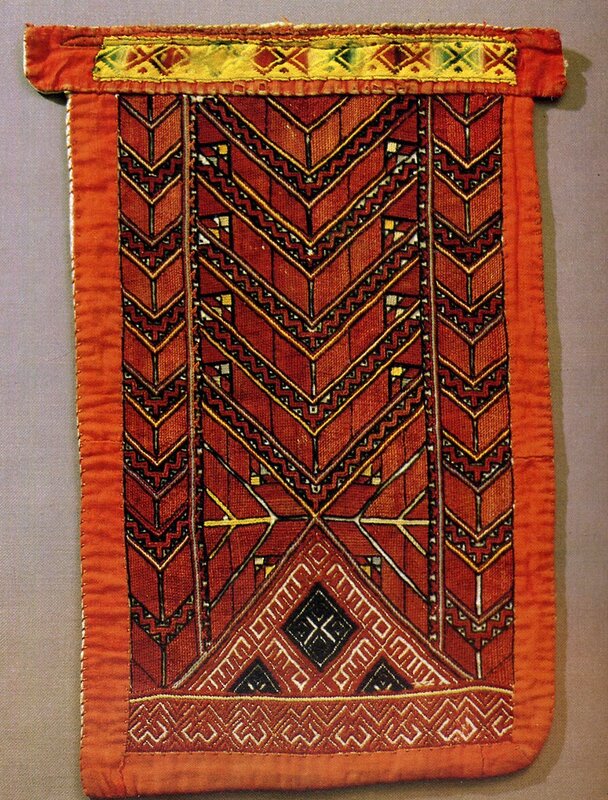 The kabachi is a rectangular piece of cloth tied around the neck that covers the front of the chemise, and over which the kaftan is worn, so that the embroidery is displayed on the chest. See my previous posting on North Udmurt Costume for more details. Here are a couple of drawings of women wearing the kabachi. 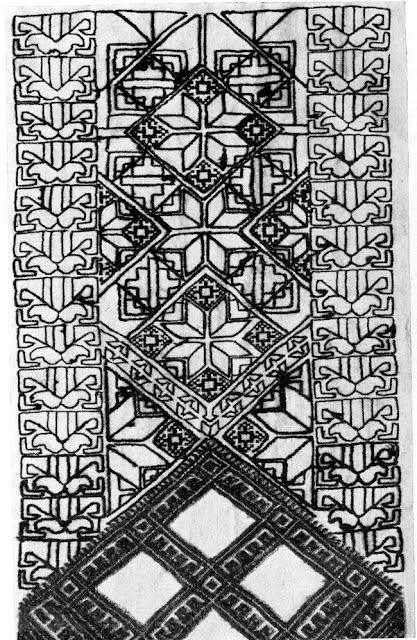 These drawings are from the book 'Udmurtskiy Narodnyj Kostium' by L. Molchanova. You can clearly see the kabachi worn under the kaftan. I put one photo of a kabachi in my previous post. 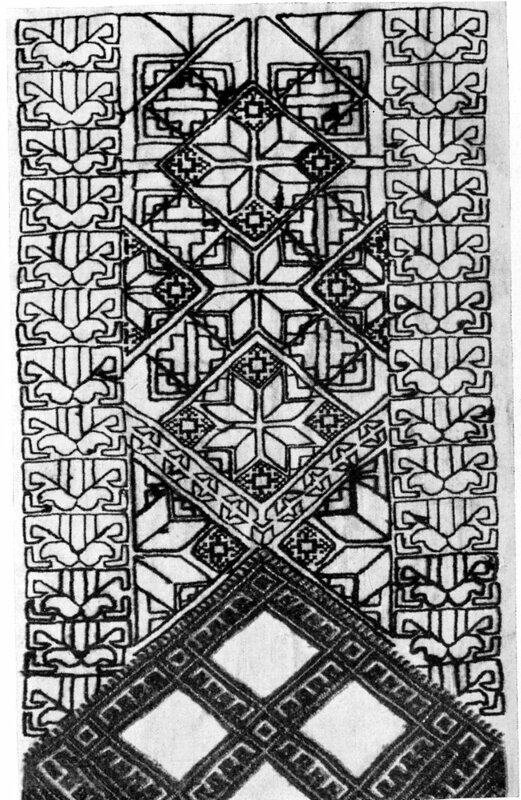 The embroidery is usually of one or both of two kinds, the first is a design executed in Holbein or outline stitch in black, after which areas are filled in with slant stitch, usually in red. The other is embroidery executed in darning, brick or counted satin stitch, mostly in red or black. Or both kinds may be combined in the same piece. Here is an example of the first kind. Notice the motif of the 8 pointed star. 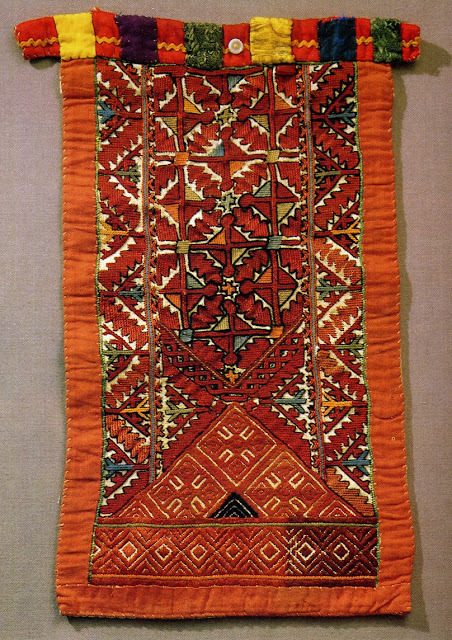 This is a very widespread motif, being found in folk embroideries of Norway and Palestine and many places in between. 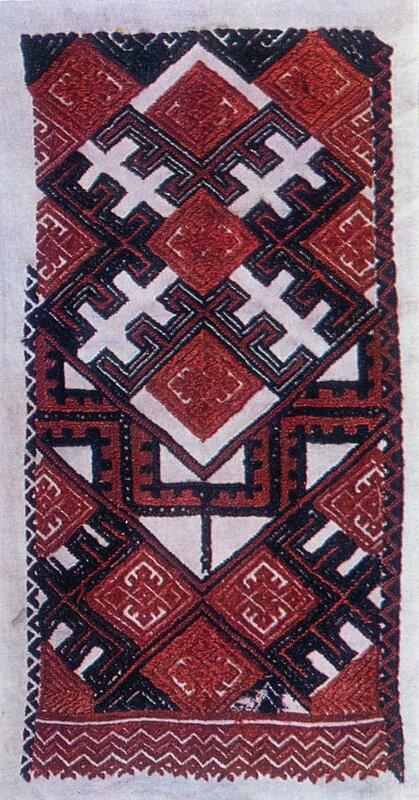 I myself grew up thinking it was a specifically Ukrainian motif. Here is a photograph of an unfinished piece, with the outline stitch in place, but the filling not yet done. 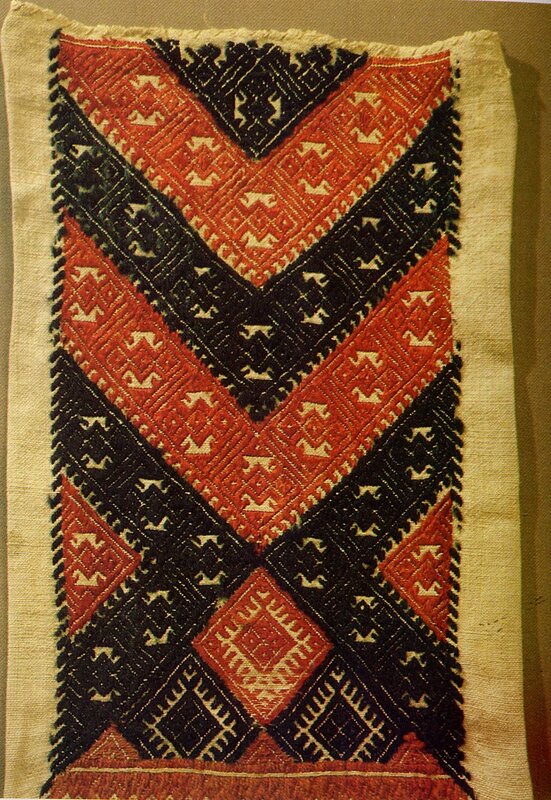 You will notice the diamond shaped intrusion of a different design and stitch on the bottom of the composition. This seems to be very common, here is another example. I do not know if there is any significance to this; if someone out there is more familiar with Udmurt Embroidery, please feel free to inform me. 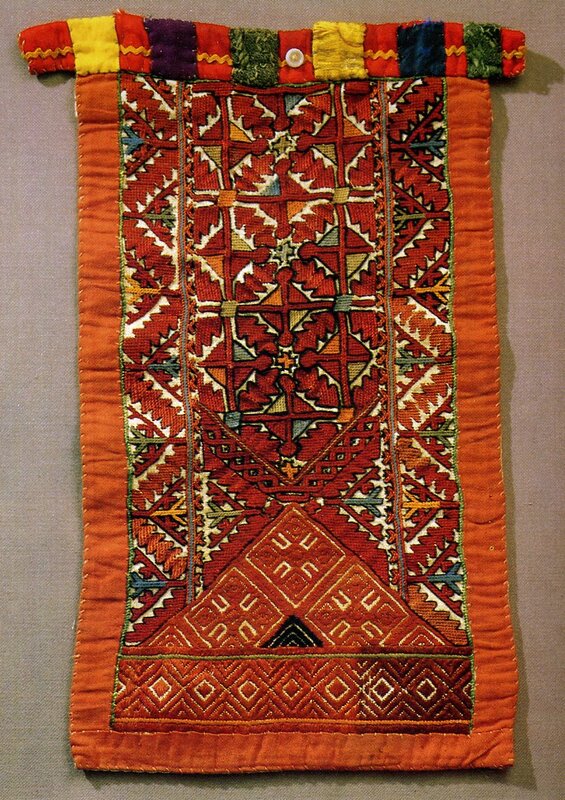 The repetitive chevrons on this piece remind me of the dresses embroidered in Palestine. There are some kabachi that do not follow this type of composition, like this one. this is a more unusual one. By the way, some of my sources insist on translating the name of this garment as 'chemisette'. When doing research in texts that are translated into English, one has to be very careful about taking translations literally. Do not assume that what they mean is the same as how you understand the word. does not include outlining the design. There is a large admixture of black in this one, as also in the following one. Notice that this one also has a horizontal design at the bottom, as do a couple of the previous ones. I will finish with one last example. I guess this was a lazy posting, but there is not much to say about these except to look at them and be inspired to go out and make one's own composition. 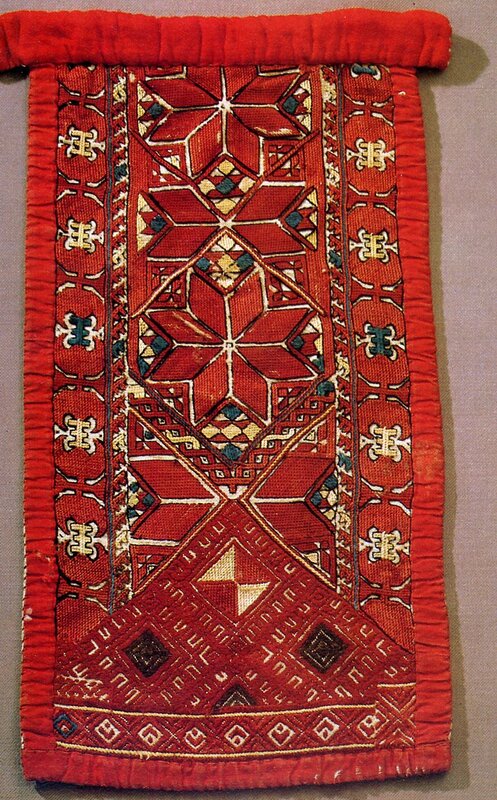 I could not possibly get across the amazing artistry of folk embroidery except by showing images. and make a new contribution. None of these embroiderers whose work i have shown today copied any of the others' design exactly. I am always open to suggestions as to subjects to write about. If, for example one of you would like to find out the folk costume or embroidery style of a precise region, please let me know. If it is within Europe or the former Soviet Union, i have a good chance of being able to answer.